What is the difference between mermaids from the sirens? In addition to embroidery stitch and cross-stitch exist and embroidery is reviving the craft, and incredibly beautiful, however, simple in technique. Thus it is possible to embroider the picture and separate the garments, and handbags. Embroidery does not require complicated equipment and materials, and the result is visible already from the first stitches. a needle with an enlarged end, colored satin ribbons with a width of 0.7 cm, thread floss, or iris green, the fabric where you are going to embroider, Hoop, pencil, paper. To embroider lilac, ribbons take color from white to dark purple. Embroider better in the gabardine, this fabric is well suited for embroidery ribbons and easy to wash. Picture of lilac take from the magazine of needlework, there are many pictures of lilac for cross stitch. The fabric pattern move with the help of carbon paper. If you choose to embroider ribbons, choose a simple figure, literally from one brush of lilac. Pull the fabric in the Hoop and make a knot of ribbons. Fold the edge and pierce it with a needle, secure a knot on the reverse side and proceed with the embroidery. The tip of the lilac ribbon embroider a darker color, so that the flowers have not yet blossomed. Buds make one stitch: insert the needle from the inside there, and the 7 mm - back inside out. Buds emphasize the thread of green, stalked seam label a twig on top of this thread, embroider flowers and buds of lilac (where the twig will be seen under colors, you get volume and realistic). Embroider flowers as buds, but four petal - from one point (1-2 mm apart). Gradually move to more bright flowers, alternating them for greater plausibility. Leaves cut out of green taffeta, the edges burn a candle, not to Majilis. Sew leaves on top of them embroider the flowers. Experiment with the technique of embroidery, find the form of the execution of lilac flowers. Thus, you get a voluminous sprig of lilac. For a first experience is enough of this lilac. You will learn to work with the band and felt the desire to create a more complex picture. In the future, use twisted seams-plaits and braids, and in the process, come and skill. Learn the hidden stitches to secure the stitches of the tape that they are not deformed and does not turn. To the bag the element of embroidery ribbons can be attached as the application, and to the bag to sew already. When inserting the needle try to get between the threads of fabric, as tape hard passes through the thread. Not outwrite embroidery on the front side, you will disrupt the structure and volume of the drawing, it is better to steam it from the inside. Make sure that the tape does not flip inside out (satin ribbons front side is glossy and the reverse - matte). Embroidery tapes are often attracted to artists because it allows you to create real works of art, and much faster than other types of embroidery. Very impressive looking flowers out of ribbon, you can start to try to embroider lilac ribbons. Stretch fabric for embroidery in the Hoop or wooden frame, otherwise it will shrink. With the help of colored pencils put the pattern on the fabric, trying to convey all the details. It is best to use a ready-made pattern, such as the painting or photo. Carefully pick up strips to work. Directly print come into the store and choose the materials: ribbon and silk thread. It is very important to choose the ribbon color. Also, don't forget the brown ribbon for the branches, green ribbon, or fabric for the leaves. Start embroidering the branches of lilac at the edges. Thread a large needle with a small piece of tape near the end so that the tip was from the inside, tie the ribbon a knot (not hard) and hide the second the tip through several centimeters from the first. Thin needle, which works on silk thread in the color of the ribbon, secure the knot, that he was lying as it should. You get a small flower, which will result in all of the branches. Tape from the inside can not be cut, and gently bring to another thread. So make the required number of delicate small flowers at the ends of the branches in three pieces. 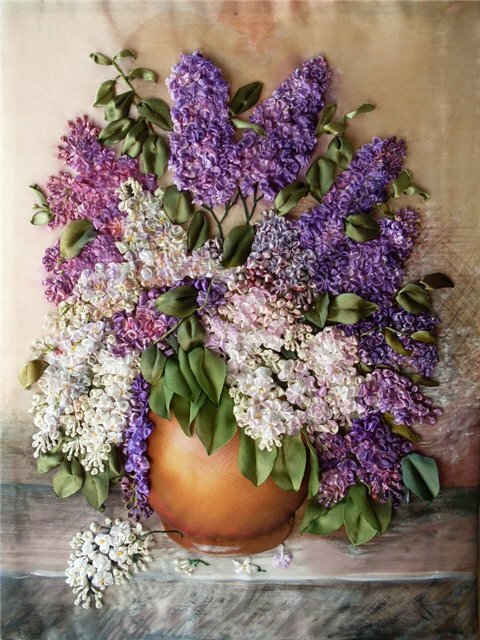 Start the embroidery of lilacs. To do this, thread the tape from the inside on the front side, here, withdraw the needle with silk thread. Pass a silk thread into a ribbon and sew small stitches across. Then, make several stitches along the edge of the tape. Turn and sew across. You will get a zigzag stitch, such zigzags may be several. Pull the thread so that the tape is spun in beautiful folds, secure the thread on the fabric. Continue to embroider the branches of lilac with small flowers from the ribbons. When the space allotted for the siren of a certain color is completed, tuck the tip of the tape on the wrong side of the fabric and fasten the thread. Continue working the ribbon in a different shade. The branches are made of brown ribbon, you can pre-screw them into the spokes. The leaves are cut from a green satin fabric, the edges burn a match, fold in half lengthwise and iron, then flatten slightly and smooth out. As a result, you should get a sheet with a strip in the center. Complete with leaves and branches, the arrangement of lilac.